This post is sponsored on behalf of Glad and Hidden Valley Ranch. All opinions are our own. 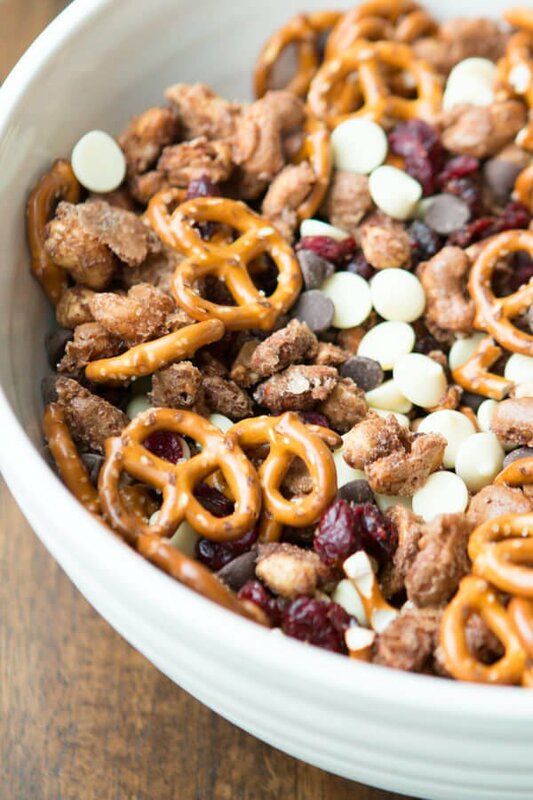 What is it about a big bowl of snack mix that’s so irresistible? 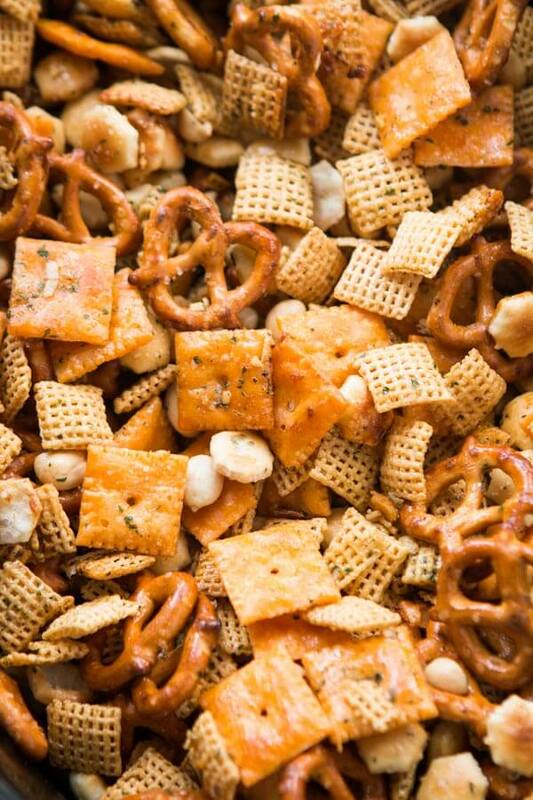 It doesn’t matter that I literally just finished a meal, or dessert, or both, I see a big bowl full of a sweet or salty snack mix, much like this ranch slow cooker chex mix and something in me awakens. Must. Try. It! Slow Cookers are safe for countertop cooking for extended periods of time. It is safe to leave your slow cooker on while you are out of the house. The slow cooker runs on very low wattage, allowing you to cook a meal over an 8-10 hour period of time. We ran off to Walmart the other day as I needed a few decorations and baking needs for an upcoming holiday party and I didn’t want to drive all over town, getting myself and a baby in and out of the car for hours. One stop was all I had the energy for. While inside I noticed a little package of oyster crackers. Yes, oyster crackers. Our oldest daughter got it in her head that she wanted some with chicken soup, but I continually forgot to buy them. Well, I tossed them in the cart, the way we all do and then I noticed a box of Cheez-it crackers on sale so suddenly I was tossing that in too, and heck, if the pretzels are 2/$3 why the heck not?! Just as I was about to check out I realized if I was going to buy this I better make it into something for the party. Someone had ditched a roll of Glad® Press’n Seal® by the bin o’ movies and suddenly I knew what to do. 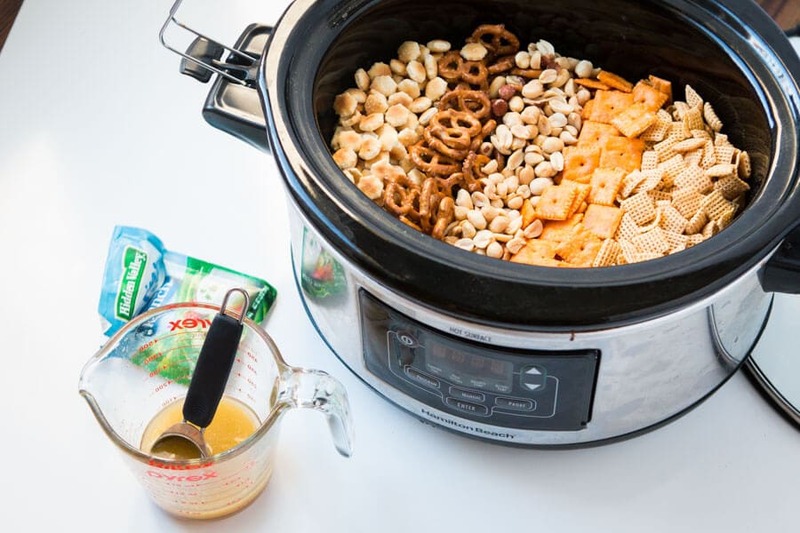 A snack mix in the slow cooker and I could cover our counter with the Press’n Seal so they could dry and I wouldn’t have to clean again. That’s my thing. When we have a party I do as much prep work ahead of time as possible so the party is never a stress and I can enjoy it. 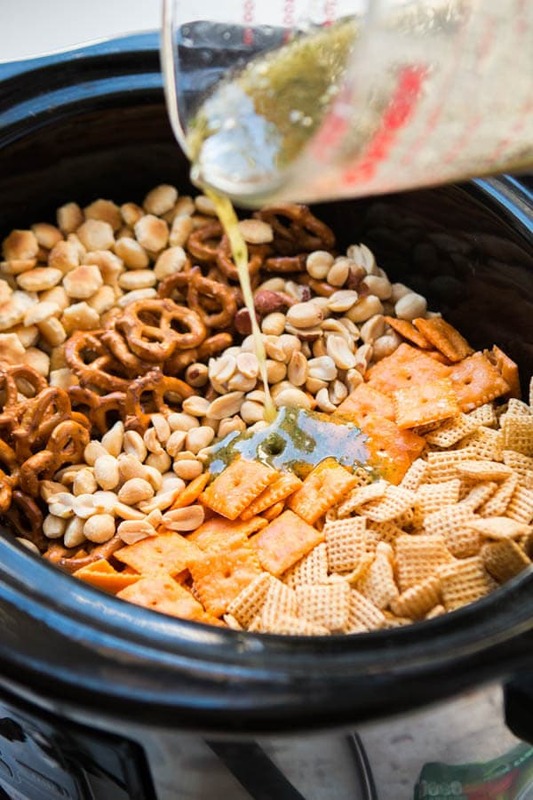 A Slow cooker is a great option to set and forget and the Press’n Seal not only allowed the crackers to cool without pulling out a pan, but I also threw the snack into the serving bowl and covered it so I really was ready without needing to fill dishes and arrange food. 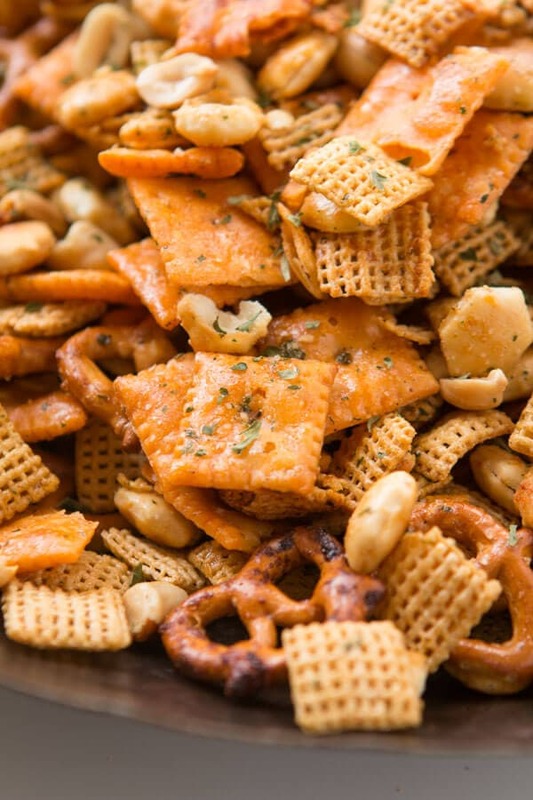 What’s in Ranch Slow Cooker Chex Mix? Each item is needed as the pretzels bring the salty but in a different way. Yes, size and shape actually do make an impact on the end result of a dish. 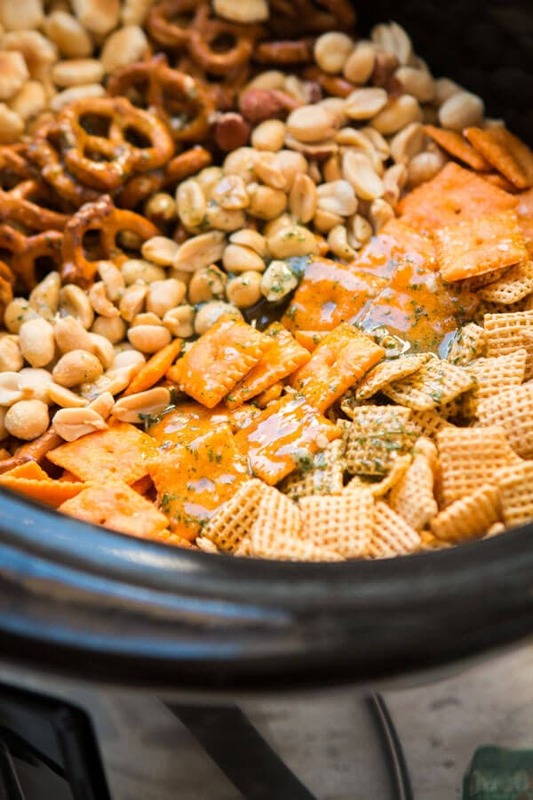 The oyster crackers were buttery pillows, the cheez-its perfectly cheesy, the corn Chex give an overall fall harvest vibe and the peanuts get a little more round and add a totally different feel in the mix. Pull out your Hidden Valley® Ranch packet that I know you have lying around from making our 3 ingredients slow cooker roast. It’s the ranchiest so don’t you dare not use it, mix it with a little sugar and Karo syrup to create a nice, crunchy coating, oil for the roasting and worcestershire. That will really pump up the savory factor. A crock pot is actually a type of slow cooker, so they are very similar, but not all slow cookers are also crock pots. A crock pot is a type of slow cooker with a stoneware pot that sits inside a surrounding heating element. A slow cooker is a usually metal pot that sits on top of a heating surface. Pour everything in the slow cooker, stirring occasionally. Pour out to cool on two pieces of Glad Press’n Seal up to 2 days ahead of time (see, get it done early!!). Then store everything in the serving bowl (how fun is this one?!) with Press’n Seal over the top. Discard the plastic from the table. You are going to be munching on this stuff all day until your guests arrive, just to warn you! Hide that stuff where you wont be tempted! Everything you could want in a snack, crunchy, salty, sweet, chocolate and bursts of bright, juicy fruit flavor. 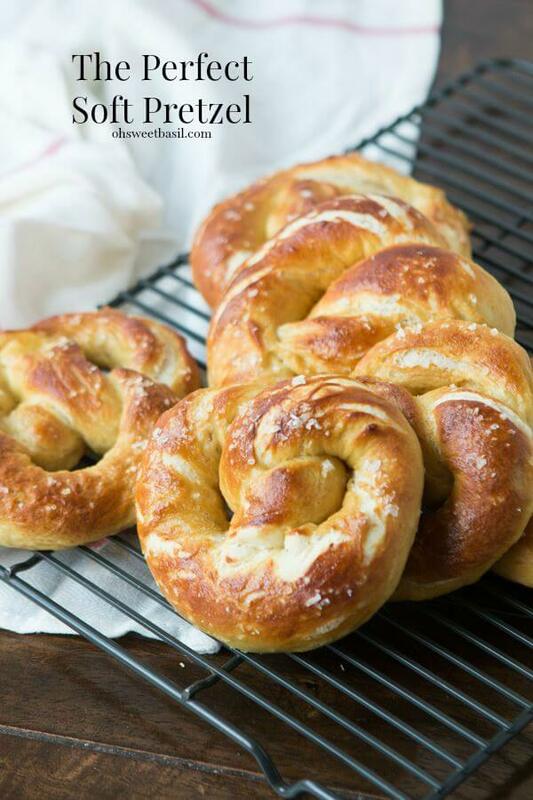 If there’s anything I can convince you to try this week it would be these big, fat, fluffy soft pretzels. In a glass measuring cup, melt the butter in 15 second intervals in the microwave. Stir in the ranch, Worcestershire, sugar, and Karo syrup. Spray a slow cooker pot with nonstick spray or line with a slow cooker bag. 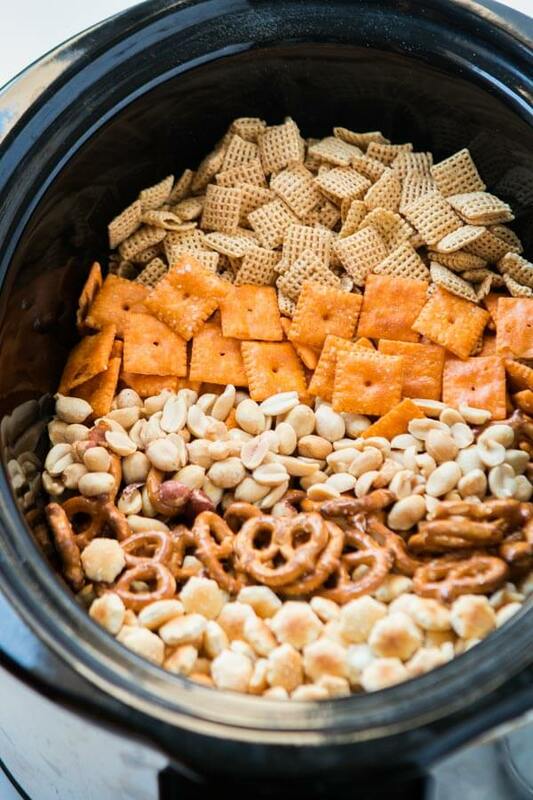 Add the cereal, crackers, pretzels and peanuts. Add the sauce and stir well to coat every little piece. Cover and cook on low for 2-3 hours, stirring at hour 1, hour 2 and one final time at 2 1/2 hours, or as needed to keep the bottom layer from burning. Pour everything onto two sheets of Glad Press’N Seal to cool. 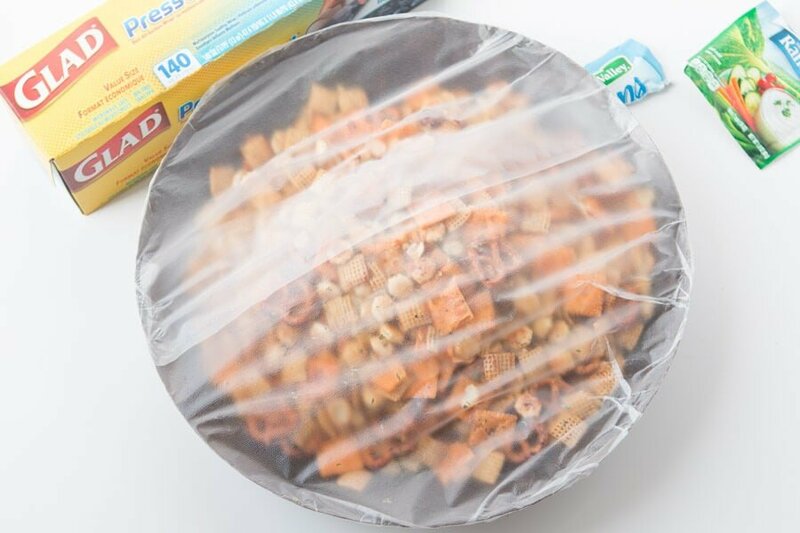 Place all snacks into a large bowl Cover with [url:2]Glad Press’N Seal[/url] to keep fresh until it’s time for the party. Please send recipes to my email. Thank you. Just like the others making as the recipe states, it turned out burned and not edible. I remade it and didn’t do sugar or syrup just butter Worcestershire and ranch mix and put in the oven on 250 for an hour and stirred every so often and it turned out great. I was wondering what you could use instead of Karo Syrup? I have never heard of that? Hi Becky! You can make your own simple syrup (1 cup sugar + 1/4 cup water), or use honey, agave, or maple syrup. Thank you!! 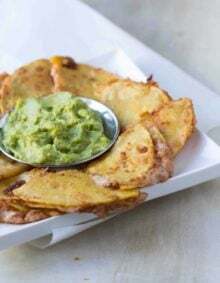 It is one of our favorite snacks for parties! My batch burned as well. Disappointed since the ingredients costs me almost $15.00. There seems to be a definite difference between the “low” temperature on your crock pot vs. many others. Hi Tricia, Were you stirring often and making sure to pull up all of the pieces from the bottom. We’ve made this in all three of our slow cookers and have yet to have an issue, so just trying to figure out what could be happening. Wow! This is delicious!! Made it last week to take on a trip with us, and only about 1/4 of it made it to the trip (due to the rest being eaten before)…the last 1/4 got devoured the first quarter of the trip! Definitely a keeper! Thanks! If you double the recipe do you increase the cook time? First- with the sugar and corn syrup, does this make it sweet? I’m looking for a really ranch-y flavor. Second- couldn’t I do this in, say, a baking dish in the oven? To avoid the burning that everyone is talking about. It doesn’t end up sweet at all but it does help everything to stick to the crackers. Yes, you could, but I think it’s the mixing often that will be the most helpful. I read the reviews about the mix burning so I used a crock pot liner, set on low & completely stirred every 30 minutes. Between the 2 hour stir & 2 1/2 hour stir it had burned to the bottom. I am not impressed with the process. The entire mix tastes of the burned pieces that were dispersed throughout the mixture. There is no separating the burned from the non burned. It ended up in the waste basket. I’m glad I did make this 2 days ahead of my planned family gathering was recommended. It allows me adequate time to rebound and make a batch of regular Chex mix. Hmmmm, I’m still pretty convinced that slow cookers heat differently as now years later we still have yet to have any issues. I’m sorry that you experienced that. What size crockpot did you use for this recipe? 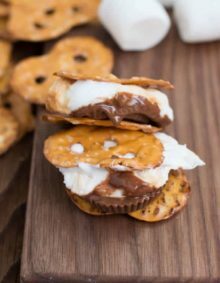 I’m looking to make a double batch, so not sure if I’ll need to make the two batches separately? Thanks! Did not care for the flavor combination at all. The sugar and corn syrup burned in the crock pot even though I stirred it every hour and left it on low. Sorry, not a keeper for us. The mixture shouldn’t have burned at all unless the heating elements are going higher than low. I’m so sorry you didn’t enjoy the flavors. Everyone definitely has their own flavors they love. Thanks for commenting. I have to say the first time I made it, it also burned in the crock pot – I had it on low. I had to pick out several black pieces before I served it. I liked the flavor but will use the oven next time…. Thank you for sharing. The tricky thing about recipes is that all appliances don’t cook the same and this is a good reminder. Definitely wise to watch how things are going and never miss stirring. If you notice it’s cooking faster always stir more often than once an hour. Glad you enjoyed the flavor but wish I could have saved you the burned pieces. Like the flavor but my batch also burned. Disappointed. Hi Char, were you stirring often and was the slow cooker over heating? This is in my crock pot right now and it smells delicious! Thanks for the recipe. Merry Christmas ? Oh I’m so glad to hear that! Merry Christmas! How long does this keep? Planning to make for Christmas, plus some extra to add to gift baskets. Thanks!! Actually, we kept ours for two weeks and it was still good! I’ve had family members keep this in the freezer throughout December and its always been tasty! Fast help please….Do you mean the HR DIP mix or the Salad dressing mix??? 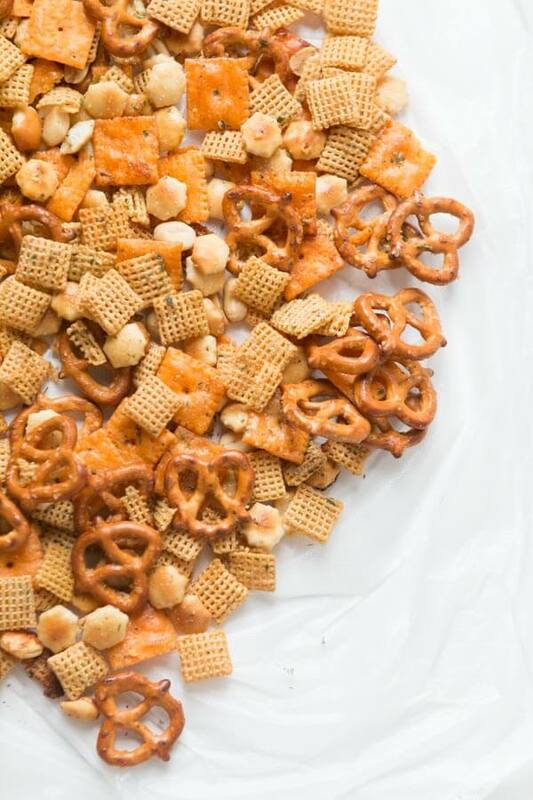 Awesome idea for Chex Mix. My kids would love this. 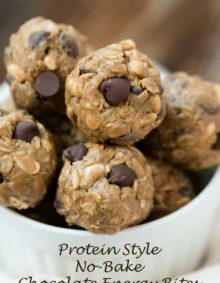 So smart to make this in a slow cooker!! It definitely made things easier! 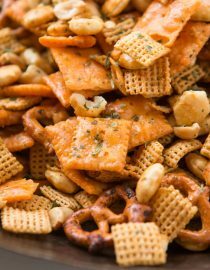 My family goes nuts for Chex Mix! Love this! Such a great snack for the family. Thanks Jenny! Isn’t there this wonderful pull when you have a dish that you grew up with? Yum! I can’t wait to try this one out!